After what has turned out to be a very moist year, we are finally nearly ready to refinish the deck. 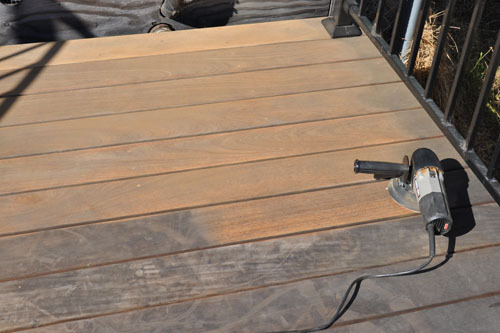 We'd planned to add another coat of finish in November, but it literally rained or heavy-fogged every day from then until after we got back from Turkey, and the deck needs to be dry to refinish. Then my health. And now it's both dry and Noel opened up some room to work on this on the weekends, so it's time to go before the rain starts again. We'd planned to resand the deck, which was part of the complication. Over the last year some of the pegs eased up a little, and others never really got sanded that well to begin with. So Noel has been doing a series of sanding passes over the deck. He just has some detail work to do around the rail posts and on the verticals. 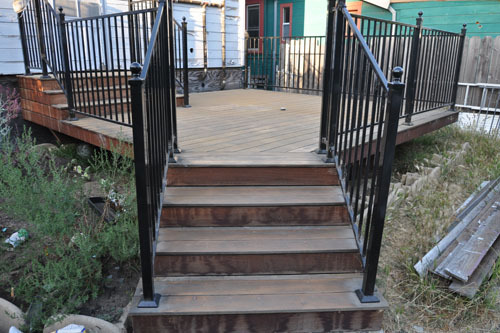 The deck does look quite a bit better, though it needs a bit of a sweep. You can see on this photo that the verticals on the stairs need some more work; they do seem to get water-stained easily. 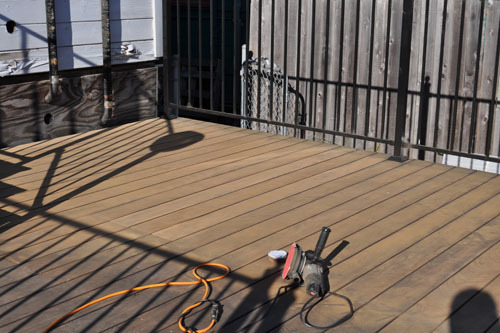 The pot of stain from last year appears to still be usable (we will know soon enough), and refinishing a deck is not one of the forbidden or strongly discouraged activities, so soon. Soon.